Signal to noise ratio (SNR) for the Pentax K-7. Full measurement for various luminosities and ISO settings at color temperature 2900°K. Measurement similiar to dxomark.com. The dotted lines indicate the slope for pure photon shot noise. It is possible to derive both dynamic range and noise from the graph. If extrapolating the 0db point for ISO 100 at luminosity 0.07%, then the resulting dynamic range is 10.5 EV (print-normalized to 10.9 EV). E.g., DxO tests the print-normalized dynamic range of the K20D to be 11.05 EV which is about the same. The flattening at 30% gray and brighter is believed to be due to systematic measurement errors like imperfect gray patches. ISO resolution test chart using FA 31 Ltd. at f/4.5. The inner part is 4x. The Nyquist limit is at "7.8" in the inner part. Watch the original at 100% size. 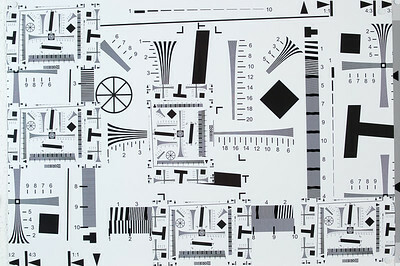 Zone plate test chart using FA 31 Ltd. at f/4.5. 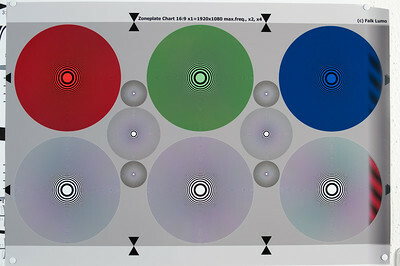 The big circles have a resolution limit of 1280 LW/PH. The smaller ones are 2x and 4x. 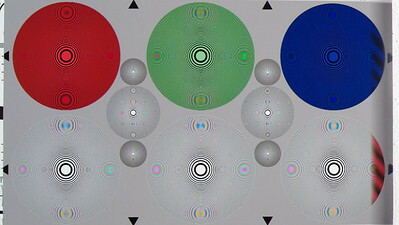 The 4x circles at above ~4000 LW/PH have uncolored printing moiré. The Nyquist limit is at 3104 LW/PH which is about 61% into the smallest circle. Watch the original at 100% size. Lumolab noise test chart for Pentax K-7 at 2900°K and ISO 100. Lumolab noise test chart for Pentax K-7 at 2900°K and ISO 100. This photo was underexposed by 5 stops! In order to make the resulting (almost black) photo visible within an 8-Bit file format as allowed by SmugMug, I pushed exposure +5EV before saving as JPG. 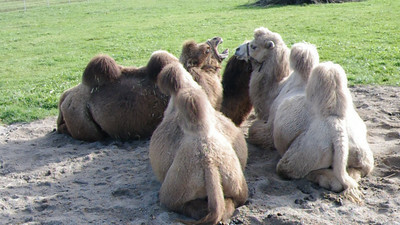 The result is seen above and theoretically, corresponds to ISO 3,200. This photo is from a different session using the identical camera and same light source as before. The slight variation in exposure is from the setup of light. Lumolab noise test chart for Pentax K-7 at 2900°K and ISO 100. This photo was underexposed by 9 stops! In order to make the resulting (totally black) photo visible within an 8-Bit file format as allowed by SmugMug, I pushed exposure +9EV before saving as JPG. The result is seen above and theoretically, corresponds to ISO 51,200. 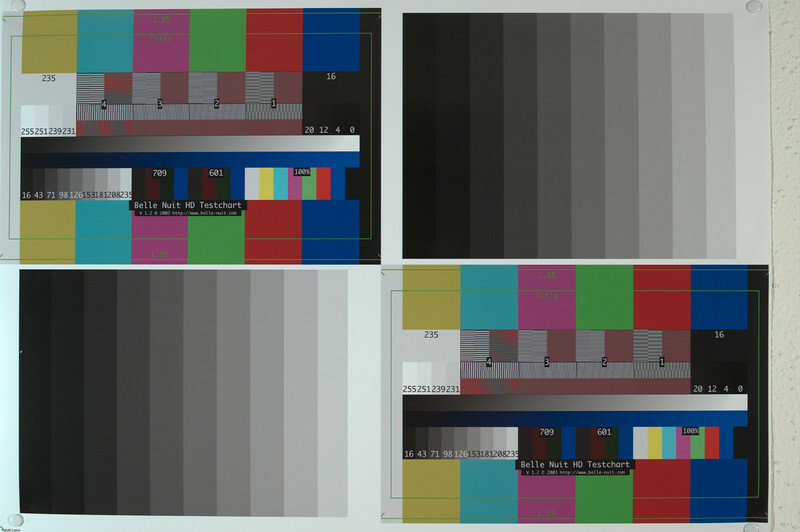 Lumolab noise test chart for Pentax K-7 at 2900°K and ISO 200. Lumolab noise test chart for Pentax K-7 at 2900°K and ISO 400. 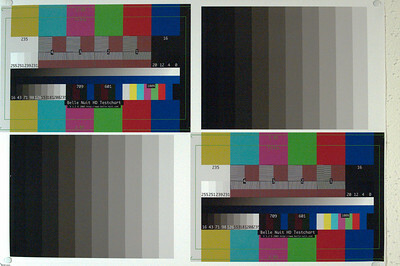 Lumolab noise test chart for Pentax K-7 at 2900°K and ISO 800. Lumolab noise test chart for Pentax K-7 at 2900°K and ISO 1600. 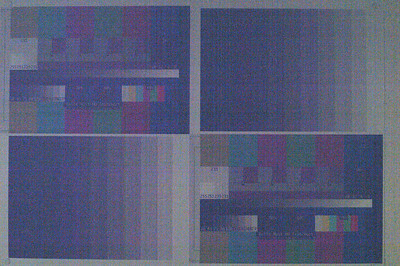 Lumolab noise test chart for Pentax K-7 at 2900°K and ISO 3200. 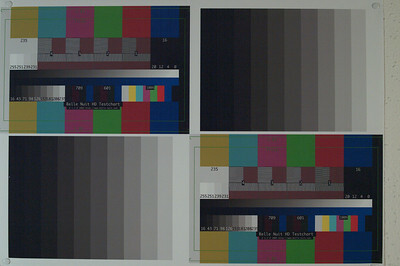 Lumolab noise test chart for Pentax K-7 at 2900°K and ISO 6400 (extended). Video frame from 720p HD mode. 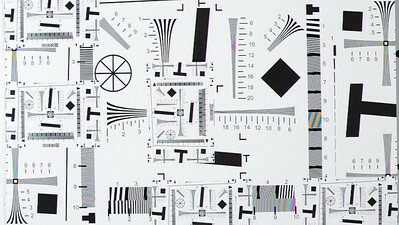 ISO resolution test chart using FA 31 Ltd. at f/4.5. The inner part is 4x. The 720p Nyquist limit is at "8.5" in the outer part. The 1024p Nyquist limit is at "10.0" in the outer part. Watch the original at 100% size. The color moiré shows that the 720p frames are downsampled from 1024p video frames. Video frame from 1536x1024p HD mode. ISO resolution test chart using FA 31 Ltd. at f/4.5. The inner part is 4x. The 1024p Nyquist limit is at "10.0" in the outer part and "2.5" in the inner part. Watch the original at 100% size. 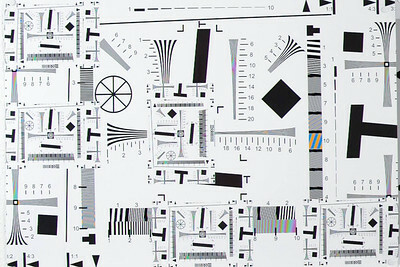 The resolved parts with distinct lines is about "8.0" in horizontal and "8.5" in vertical direction, corresponding to 1200x850 pixels in 3:2 or about 1200x717p pixels in 16:9 mode.